The Texas A&M University IT Disaster Recovery Program supports the Texas A&M University Emergency Operation Plan, and seeks to improve the university’s ability to recover during an emergency by enabling coordination and prioritization of IT recovery efforts. Essential IT services that support essential functions as defined by Annex J (Institutional Continuity Plan) are managed in the Division of IT DR Plan (TAMU IT DRP). IT services critical to individual department/units are managed in unit-level IT DR plans. Non-critical IT services are listed in department/unit-level plans, and have minimal requirements for backup validation testing (see CP-4 Contingency Plan Testing and CP-6 Alternate Storage Site for requirements). The complexity of an IT Disaster Recovery Plan (IT DRP) is dependent on whether the department/unit manages mission-critical information resources. The Information Resource Owner is responsible for determining if an information resource is mission critical. A mission-critical information resource is defined as an information resource crucial to the continued performance of the department/unit’s mission. All mission-critical resources require a unit level IT DRP. 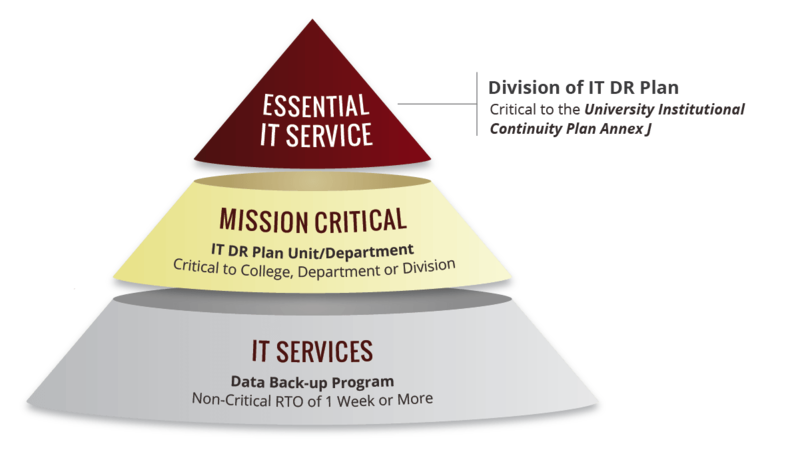 The Division of IT DRP is limited to Essential IT Services that support essential functions as defined by Institutional Continuity Plan (Annex J) of the Texas A&M University Emergency Operation Plan. Organizations that support essential IT services will maintain their own procedures and actively participate in the training, exercise, and maintenance needed to support the Division of IT DRP.